Audrey and I have been taking a break from baking . . . I know, I know, such a shame. It’s just that the whole house heats up the instant we turn on the oven. Consequently, we open the windows and doors, only to attract a host of fluttering insects that seem to thoroughly enjoy orbiting my head during photoshoots. So rather than suppress my sweet tooth entirely, I’ve opted for more appropriate warm weather desserts, such as ice cream, fresh fruit, and this panna cotta. The first time we made Claire’s coconut panna cotta, we were hooked. Something about that cool, silky coconut cream that is simply irresistible. I decided to make a topping that was reflective of what I had in the kitchen at the moment – blackberries, thyme, and sloe gin. Sloe gin is made by soaking sloe berries (a relative of the plum) in gin. The result is a bright, fruit forward liqueur that I feel perfectly compliments both the blackberries and thyme in the sauce. Bon appétit!! 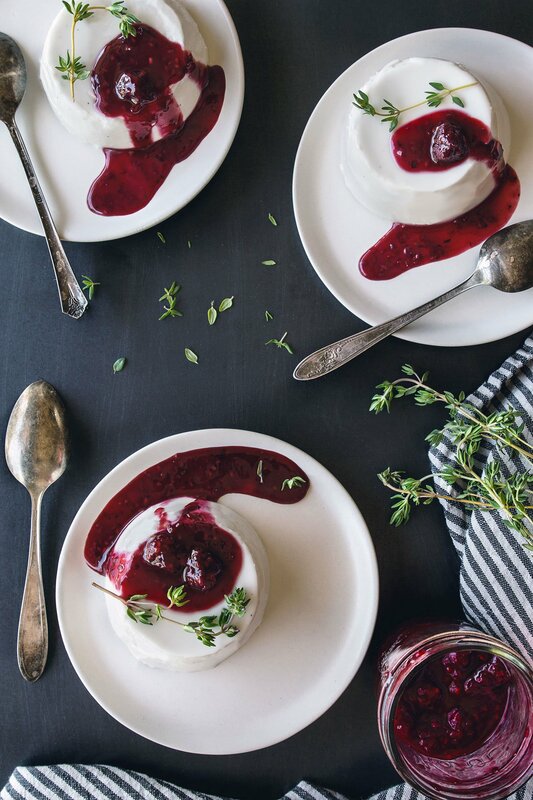 This honey sweetened coconut cream panna cotta pairs beautifully with a blackberry, thyme, and sloe gin compote. This makes for a delicious dairy free dessert option that doesn't require an oven! In a large jar with a sealable top, combine coconut cream, honey, and lemon juice and stir to combine. Seal the jar and let sit 8 hours or overnight. The next day (or 8 hours later), warm the coconut cream mixture with the vanilla bean over medium heat, stirring frequently until warmed through. Off the heat. Combine the hot water with the gelatin in a small bowl and stir until the gelatin has dissolved. Add this to the warmed coconut cream, stirring well. Divide into ramekins and let cool to room temperature. Transfer to the refrigerator to firm, at least a couple hours. Combine the blackberries, lemon, thyme, and sugar together in a small saucepan over medium-low heat and stir constantly until the sugar is dissolved. Let the mixture simmer until the berries are soft and starting to break down, about 7 minutes. Meanwhile, combine the cornstarch and the sloe gin in a small bowl and stir until the cornstarch is dissolved. When the berries are soft, add the sloe gin mixture, stirring frequently, continuing to simmer over low heat for a couple minutes until the sauce has thickened slightly. 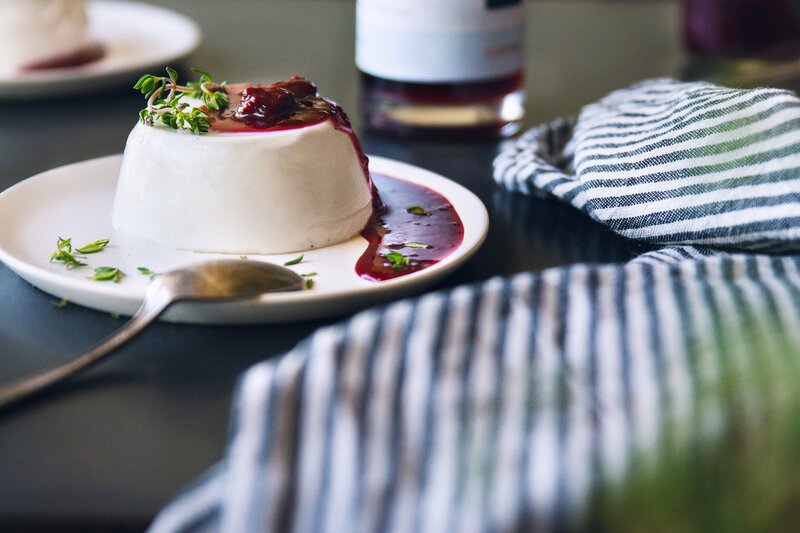 Serve warm or room temperature over the panna cotta! I’m so excited to make this tonight but I just noticed step one. Could I skip that step and mix them all together in the pot? The compote was delicious, I had high hopes for the panna cotta which was tasty but the cream separated out when it cooled, so I ended up with a very gelatinous top and a firm, almost coconut oil type bottom. This is a gorgeous recipe but unfortunately my guests and I found we didn’t care for the coconut milk in the panna cotta. It took on a slightly bitter, off-taste. I may try again but with a standard milk based recipe. Also the panna cotta overwhelmed the subtle flavoring in the compote. My sauce turned out much thicker than what is shown in the picture so I would slightly reduce the quantity of corn starch. Thanks Karen! So sorry to hear that it didn’t work out for you. I did not experience the same problem with the bitterness that you did, although I should say that it certainly isn’t the same as a traditional panna cotta, as the coconut flavor does come through. However, I feel like it makes for a good dairy-free alternative. The compote can thicken if not used immediately, and probably also depends on other variables like exact simmer time, temperature, how much liquid your blackberries have, etc. The good thing is you can easily adjust with a bit of water, lemon juice, or in this case sloe gin 🙂 Anyway, sorry again, and thanks for stopping by the site!! I so feel you on the oven heating up the house! I think I’ve had my windows open for a month now. The blackberry thyme slow gin compote turned out beautifully and sounds like summer. I WANT!! Will be trying this for sure….”Coconut Cream” will be a first time purchase, assuming it is readily available….any tips on who sells this? Love everything about this dessert! The simplicity, the perfect taste combination, and the gorgeous pictures! The addition of blackberry compote is genius! Just gorgeous, I love that blackberry compote! This does look Honestly Yum! I will have to try it when my blackberries are ripe! Is coconut cream a common grocery store staple or will I have to order it online somewhere? I see coconut milk all the time but not cream. 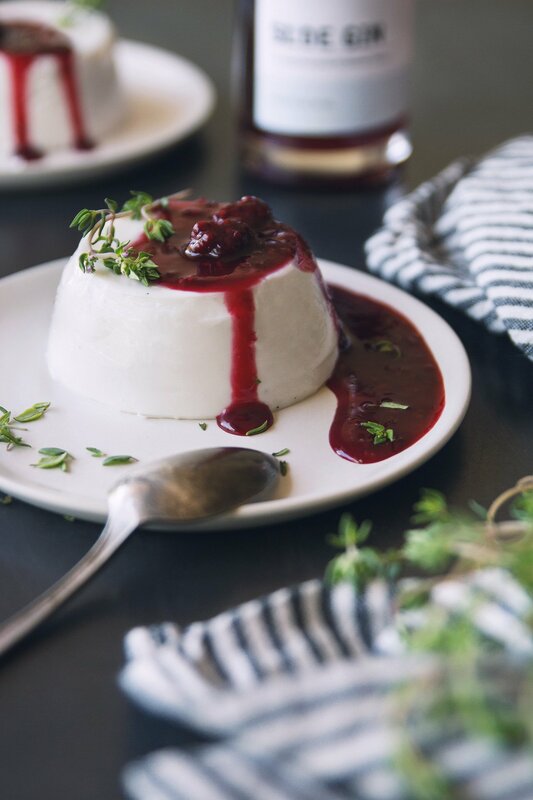 Oh wow this panna cotta looks amazing and I believe that thyme goes so well with blackberries, yum! I have actually never used thyme in a dessert but this looks so yum! Love a great panna cotta! This is so gorgeous! I love panna cotta, and am happy I now know that sloe berries are a thing :).